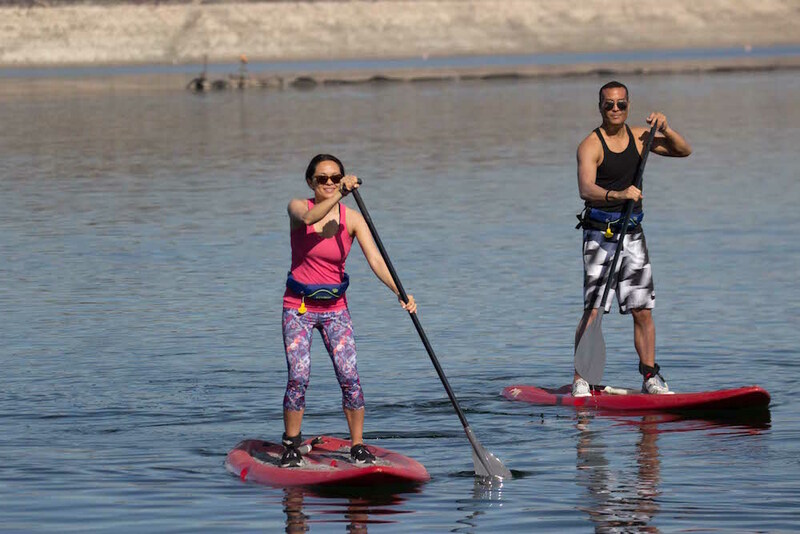 Stand-up paddleboards (SUPs) come in a variety of shapes and sizes designed for a specific type of paddling. It is important for a paddler to choose the right board for their size and for the conditions they will be paddling in. Stability: The shape of the board will impact the stability of the board and ease of use for the paddler. A board may have a planing or displacement hull shape. A planing hull creates lift and rides on top of the water. A displacement hull is like the bow of a ship, it comes to a point and cuts through the water. Sizes: Smaller boards are generally less stable. The board’s length also impacts maneuverability. Longer boards over 10.5 feet track well, but take more skill to maneuver. Boards under 10.5 do not track as well, but are more maneuverable. Volume: It is important that a paddler selects the right SUP for their bodyweight, including the weight of any carried equipment. Beginners should choose a board that is wider and has more volume. A board also has a fin that goes into the water that impacts both stability and maneuverability. A taller fin provides more tracking and stability while limiting maneuverability and creating additional drag. Shorter fins are more maneuverable, but provide less stability and help less with tracking straight while paddling in flatwater. Life Jackets: A SUP is considered a vessel by the U.S. Coast Guard and as such is subject to life jacket carriage requirements. The Coast Guard recommends that all boaters, including paddlers, always wear a life jacket. Inflatable life jackets are not recommended for poor or non-swimmers. Belt packs should be worn in the front. If the wearer plans on donning the life jacket while in the water they should practice to ensure they are able to do so. Leash: It is generally recommended that a leash always be worn this is to prevent the board from getting away from the paddler. There are different types of leashes, and the type a paddler selects should be based on the conditions they will be paddling in. Also an ankle or calf leash may not always be the best choice. If in doubt ask an expert who will be able to advise on the best choice. These are common types of stand-up paddleboards. All-around stand-up paddleboards are designed for all types of water conditions ranging from flat-water lakes to surf. They provide good stability and are a good choice for beginners. Surfing boards are shorter boards (low volume) that are designed to be more maneuverable on surf but are more difficult to paddle than all-around boards. They have a narrower nose to make it easier to catch waves and more curve (rocker) to make them turn more quickly. Surfing boards move slower and don’t track well on flat-water surfaces and also are less stable. Touring boards (high volume) are designed for leisurely paddling on flat-water rivers, lakes, and open water. They come in a variety of shapes and widths that will greatly impact stability and speed.